This orchid is a self-fertilizer. You’d think it would be able to apply pollen to itself without help, but no. It’s the romantic rain that provides the motion which allows the plant to procreate. Hot! 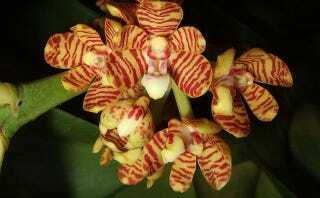 The Acampe rigida orchid can be found all over southeast Asia. It’s a tremendously successful plant, in part because it doesn’t need another plant to be close by in order to produce seeds. The plant is capable of fertilizing itself successfully through generations, although it’s not technically self-pollinating. A self-pollinating plant doesn’t need outside help to get its pollen to the female reproductive organs. The orchid needs help, but fortunately, help is almost always on the way. That help takes the form of the natural phenomenon that brings on hook-ups in 90% of romantic movies—rain. Rain makes this staid little orchid erupt into a self-fertilization frenzy. The first drop takes a the “cap” covering the pollen off. The pollen is held on a “stipe,” a delicate stalk that supports the accumulated pollen. When a droplet hits the stipe and bends it down, the stalk bounces back and throws the pollen into the orchid’s own inner cavity. The process happens in every flower, meaning one rainstorm knocks the entire plant up.